The dreaded BSS (Big Step Syndrome)! While this is usually a guy thing because their strides are generally longer, women are also caught taking big steps on the social dance floor. Why this is so “deplorable” (not truly) is that on a small, crowded floor, your big steps will end up on top of other’s feet if you’re not super careful. 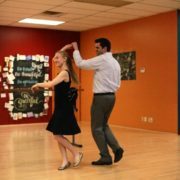 You may not know this, but there is a difference between social dancing and competitive ballroom dancing, and this is one of them. “What is arm styling?”, you ask. 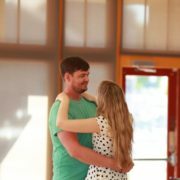 Arm styling is what you see when trained ballroom dancers want to pretty up their movements instead of letting their arms dangle by their sides as they dance (makes sense). If you have ever seen an episode of Dancing With The Stars, you’ve seen lots of arm styling in action. 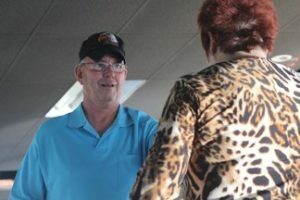 It makes for an awesome look on a stage or at a competition, but not while you’re out social dancing. Think of how it would feel to get whacked in the face while Salsa dancing, or hit with an elbow Country dancing. It’s really not that fun. 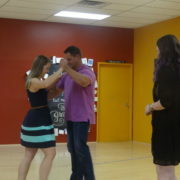 Bottom line, for those of you who have had formal dance instruction, that’s amazing!! !, but leave the big arm movements off of a packed dance floor. I discuss this “deplorable” offense often. I can’t help it! As a follow on the dance floor, it’s so much more fun to dance on time with whatever song is being played. If you’re a guy who can’t hear the beat, that’s totally OK (for now)! Go ahead and take some Private Dance Lessons to learn how to count out the music in your head-no “1,2,3” out loud as you’re dancing! It’s a wonderful feeling to know if you’re on tempo, so don’t hesitate to seek help in this area. Plus, know that with each style of dance, there are many sub-dances, if you will. 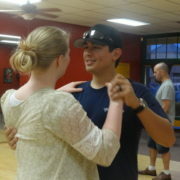 For instance, Latin music does not always equate to Salsa dancing. The Latin dance music you’re listening to could be a Bachata, Merengue, or Cha Cha. It’s key to go out onto any social dance floor with confidence, so discover through your Private Lessons which songs fit with which dance. 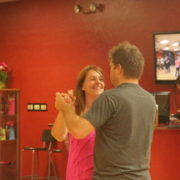 Honestly, I can think of no better hobby than social dancing. It’s relaxing, yet exciting. Challenging, yet fun! It is possible, though, to go too far out on a social dance floor. Imagine 50 couples sharing a 20×20 space. You’re virtually crammed in like sardines! This would not be the best time to pull out all of the fancy tricks you learned at your last dance class. While I’m not saying to just stick with the basics, though there’s nothing wrong with that, please don’t attempt lifts, dips and the like on a jam packed dance floor. A few years back, I was out at a local Country bar with my husband (date night!). The couple next to us were getting a bit wild, which we expect when we go Country dancing here in Arizona. But what I didn’t expect was that he would end up grabbing her by her long ponytail and dip her…by her ponytail! Her head nearly hit the floor, and before we knew it, she was back up in his arms. He had no grip on her neck and no support under her body. He simply took her hair and down she went. A sigh of relief came over me when she returned from her dip in one piece. Not just for her safety, but for the safety of everyone surrounding them. I was actually frightened, and I wasn’t even the dipee! I can’t imagine how she felt! My point is…there’s no reason to get carried away just because you want to let look and you know a few cool moves. Have fun, be safe and be mindful of others. Have you learned something new through this blog? If so, please share in the comments section below. 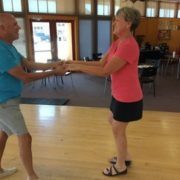 I’d love to hear your take on the social dancing scene in your area. What’s hot, what’s not, and what you see when you go out to dance. Come Country Dancing in AZ With Us!